Arginine Powder. This drink mix delivers 4.5 grams of L-arginine and vitamins C and E for wound management. With only 25 calories per serving, it's suitable for those with diabetes or those who require a calorie restriction. Available in Cherry and Orange. 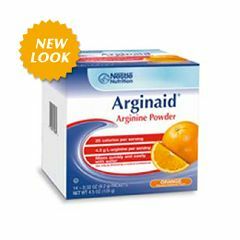 ARGINAID® contains L-arginine along with vitamins C and E to support wound management. This drink mix blends easily with water, fruit juices, yogurt or applesauce - providing a convenient way to supply vitamin C, vitamin E and 4.5 grams of L-arginine per serving. And, with only 25 calories per serving when mixed with water, it's suitable for people with diabetes or calorie-restricted diets. Product in new packaging; as we recognize that some customers prefer to avoid artificial colorings, we have removed artificial coloring in the ARGINAID® products. The removal of artificial coloring may affect product appearance but a marked difference was not noted for this product. Ingredients: L-arginine Powder, Citric and Malic Acids, Sodium Ascorbate, Alpha-Tocopheryl Acetate (Vitamin E Source), and less than 2% of Aspartame▲ (Sweetener), Acesulfame Potassium (Sweetener), Natural and Artificial Flavor, Color (Beet Juice, Turmeric and Annatto Extracts). Some flavors cost more. Prices go up down. Vascular integrity. Hypercholesterolemia. Excellent Nutritional sup. There is a great deal of science available in regard to the benefits of L-arginine. Other products are available with L-arginine in them but they normally have more calories than Arginaid, which is important for diabetics, and are more expensive. Capsules in stores don't offer the 4.5g per serving, unless you take an unbelievable amount of them per day. The flavors offered, and the individual packets available, make the L-arginine taste good and easy to add to a bottle of water for on the go. Good Taste. Simple To Take. Women. Daily Use. Diabeticslow healing. Perscribed by physician after surgery. Simple To Take. Produces Results. Good Taste. Acts Quickly. Short-Term Solution. Men. Women. Medical treatment. Older People. Daily Use. I use this product 2X's daily for the medical condition of Prinzmetal. It's easy to take, but I do wish the flavor was not as strong. It is not strong enough to ward off the larger heart attack feeling vasospasms, but it seems to take the edge off of the smaller daily vasospasms. Good Taste. Simple To Take. Boosts Energy. Goes Down Easy. No Side Effects. Produces Results. Acts Quickly. High Quality. Good Value. Good Taste. Simple To Take. Goes Down Easy. No Side Effects. Produces Results. Good Value.